This pale Khaki Green t-shirt has a scoop neck with ruffle detail on the front of each shoulder. In excellent, rarely worn condition. 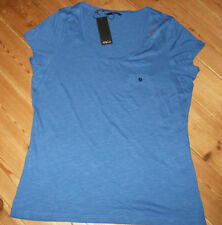 New blue t-shirt top from M&Co size 12. A mid-dark blue colour - label states colour as 'Bluebell'. Collection in person is available from Glossop (east of Manchester). M&Co Ladies Brown Strappy Beaded Top. Beautiful brown strappy top with beaded design at bust. Lovely casual top. Light blue and sliver top. Blue floral pattern vest top from M&Co with frill scooped neckline and popper style detailing on the front. None Specified. Nape to Bottom Hem 66 cm. Underarm to Underarm 53 cm. M&CO WHITE MIXED STRIPED T-SHIRT. Ladies M&Co White T Shirt. Cap Sleeve. 100% Cotton. see photos for colour and pattern. This t-shirt has a round beading detail embellished neckline and is sleeveless. It is made of slightly stretchy material. M&Co, Size 14, Turquoise, white & blue checked cotton shirt with silvery thread running through it. Long sleeved. In good condition. This is a used item in excellent condition. The top has a v neck and there is lace detail across the shoulders. White / Multi Short Sleeve Floral Top By M & Co. Shoulder to hem 23". Pit to pit 20". A very pretty t-shirt made of very stretchy material in excellent condition. Any questions please ask. Bidders from outside Europe please email me for postage costs. 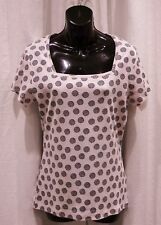 WOMENS PRETTY V-NECK VISCOSE SLEEVELESS TOP SIZE 12 FROM SPIRIT & M&Co. This top is from M&Co and in a size 12. WHITE & GREY WITH A SCATTERING OF GREEN. Eye-catching Floral Top - M & Co Spirit - Size 20. 24" (61 cm). Has a scoop neckline and long sleeves. There's button detailing to the front neckline. Ladies Pretty Summer Top Size 10 New. This top is new with lovely detail to the front. M&Co Navy Vest Top with pretty Seashell print all over. Here is a lovely 3/4 sleeve check top, to fit a woman size 16. It is a blue with brown & white check with small buttons down the front. M&CO Red floral / short sleeve scoop neck top size 18. beautiful red floral t shirt v neck top. Very useful basic item to any wardrobe. no tears or repairs pet free and smoke free home please take a look at my other items thank you for looking Condition is Used. Dispatched with Royal Mail 2nd Class. Size 10 fitted stetch tee. The fabric is a cotton elastane blend. Denim Jackets. Denim Waistcoats. Lee Cooper. Material: Cotton Elastane Blend. Pattern: Floral. Size Guides. Main Colour: Pink. The Edit M&Co. white top with Multi coloured sequins all over. Dusty pink stitching on the edge of the top. Lined. Sleeveless. Some sequins missing from the shoulder area. DAMASK BROWN TOP 3/4" SLEEVES. WITH 3 FANCY TIES ROUND NECKLINE AND DOWN FRONT. 100% COTTON.